The event, a celebration of youth and the culture of Tunisia, a product of more than three thousand years of history, was the major highlight on Sunday 9th April, at the opening ceremony of the 2017 ITTF African Junior and Cadet Championships in Tunis. 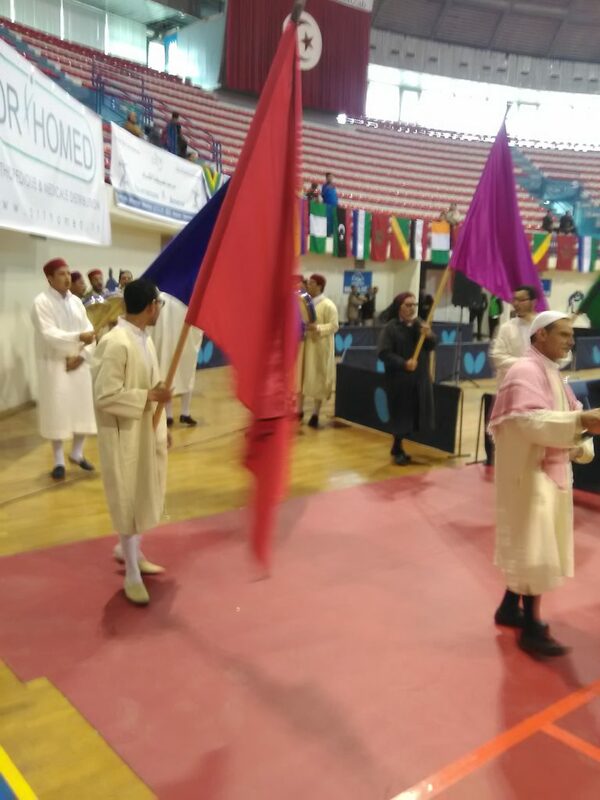 Before the march past from the participating countries, the El Sulamia Group thrilled the spectators with their sonorous traditional and spiritual musical presentation. The sound of the drums coupled with the rhythm from the flute enlivened the venue – Palais Des Sports d’El Menzah and the dignitaries present listened with rapt attention. The march past was conducted alphabetically with Algeria leading the teams to the stage. The brief but spiritually inclined ceremony also witnessed speeches from the representative of the Tunisia Ministry of Youth and Sports as well as the President of ITTF Africa, Khaled El-Salhy. Also present were the executive council of ITTF Africa as well as ITTF Vice President, Cherif Hajem. However, a delighted President of Tunisia Table Tennis Federation, Lotfi Guerfel welcomed the players and officials while the ITTF Africa boss applauded the efforts of Tunisia at staging an important tournament which serves as qualifiers for the World Junior Championships and World Cadet Challenge. “We are grateful to Tunisia for agreeing to host this important championship in the Calendar of Africa. We have been seeing the efforts of the country yielding as some of its players have started winning medals at ITTF Junior Open. For us this is a good development and we hope staging this championship will continue to help the growth of the sport. We welcome every team as we have over 13 countries in the tournament and we wish all teams well”, Khaled El-Salhy.